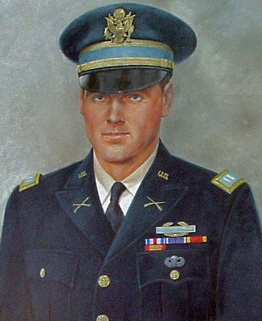 Captain Clark Newell Woodworth, Jr. was born on September 19, 1934 in Ann Arbor, Michigan to Clark and Rose Woodworth, Sr. Clark graduated from Ann Arbor High School in 1952, and from Michigan State University in 1958. 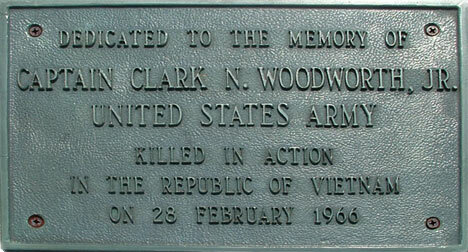 Captain Woodworth, Jr. began his career in the United States Army on January 2, 1959. 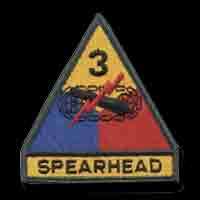 He was assigned as the Drone Section Commander in the 503rd Aviation Company of the Third Armored Division, United States Army, Europe (Germany). He was based at Fliegerhorst Airfield, Hanau, Germany from September, 1961 to January, 1964. He also commanded C Company Seventh Battalion, Third Training Brigade at Fort Gordon, Georgia from December, 1964 to December of 1965. Clark began his tour in Vietnam on January, 3, 1966 serving as an advisor with the 10th ARVN Infantry Division, Advisory Team 87, HQ, MACV Advisors, MACV. Captain Clark Newell Woodworth, Jr. was killed on February 28, 1966 as a result of multiple fragmentation wounds in Binh Thuy Province, South Vietnam. Captain Woodworth, Jr. is survived by his wife and a sister. He lived 31 years, 5 months and 9 days. A memorial fund was set up in Clark's honor. 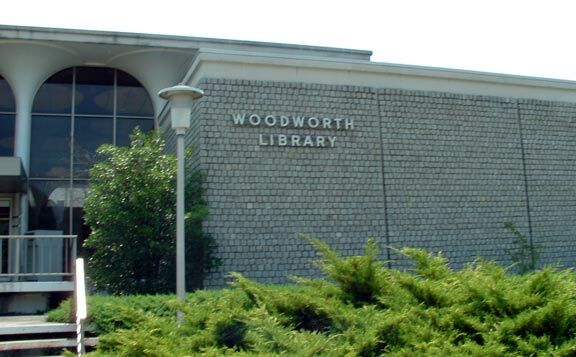 The Woodworth Library (below) is a 40,000 volume library located inside the entrance at Fort Gordon, Georgia which is named in honor of Clark. There is a portrait of Clark that is hung in the library that was painted by Norman Adams. Clark Newell Woodworth, Jr. is at rest in Arlington National Cemetery. His name is located under Ann Arbor on the Vietnam Memorial located at the Ypsilanti Township Hall, and is located on the Vietnam Memorial in Washington, DC on Panel 05E Line 092. Woody, I always remember you fondly from our old days in the 503d Aviation Company.